I have literally been looking forward to Ashley and Matt’s wedding day for well over a year. It came and went quickly, that’s for sure. One of my biggest goals with all of my wedding clients is to become more than just their wedding photographer. After all, photographing this time in a couple’s life is so intimate and special. I always feel honored when I am hired to be a part of a wedding day. I had a good year or better getting to know both Ashley and Matt. I was able to hear about their relationship, what they liked/disliked, Ashley texted me throughout the planning process to get my opinion, and that meant/means a lot to me. When they’re day finally arrived, it was so awesome seeing all of their visions come to life. The days following up to the wedding day were quite scary. We were watching the weather forecast closely, as Hurricane Florence was projected to slam right into the coast of South Carolina. The wedding was to be held on Pawley’s Island, so you can imagine the fear that was crossing all of our minds. But, with a whole lot of prayer and faith, Pawley’s and more specifically, Litchfield Beach and Golf Resort was unscathed by the storm. The day could not have been more perfect! We had biggest sunshine and the bluest of skies! 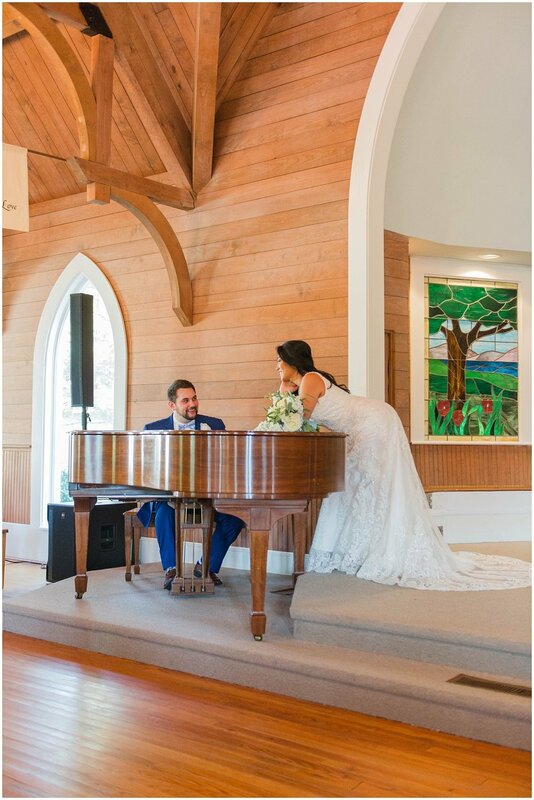 The ceremony took place at the cutest little chapel, Pawley’s Island Community Church. It had the most beautiful interior with glossy wood beams and floors, lined with wooden pews. There was stunningly, detailed stained glass windows in the pulpit, along with beautiful windows throughout the rest of the chapel that let in the most enchanting natural light. Once the sweet couple said I do and sealed their vows with a kiss, their guests lined up outside the chapel to see them off to the reception through a sea of blue and white ribbons. I absolutely love that they decided to do a send off after the ceremony as opposed to at the end of the reception. 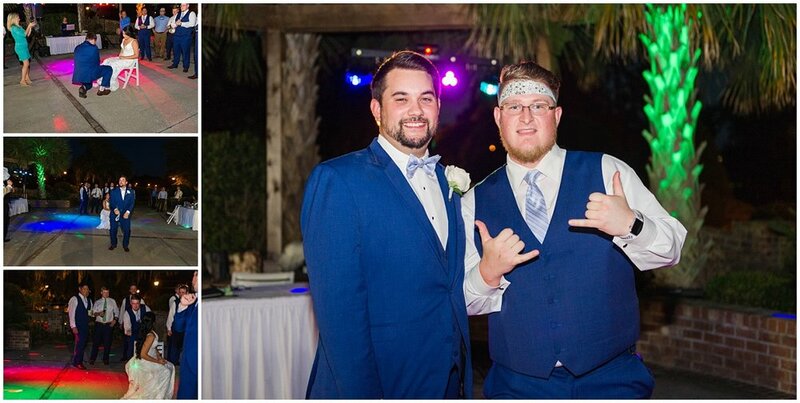 Their outdoor reception took place at Litchfield Beach Golf and Resort a quick few minutes from the ceremony site. After announcing of the wedding party, Ashley’s daddy made the sweetest speech and Matt’s uncle gave the blessing. The food was catered by the resort and was so delicious! (Shout out to those scalloped potatoes, I probably could’ve eaten my weight in them with zero regrets…) Ashley and Matt had Tad and Lyndy Graham of Graham Entertainment DJ/MC the evening, and they seriously never missed a beat. The entire evening was so entertaining and fun! Besides music and dancing, the reception also included sentimental speeches from Ashley’s sister, Samantha, who had me tearing up behind my camera. (There’s literally nothing better than the bond of sisters. I have 3 so I’m kind of an expert on the matter.) and Matt’s brother also prepared a speech, but mentioned he decided to wing the speech instead and I think he nailed it perfectly. You could definitely feel the love and adoration from their siblings, and that made my heart happy. The entire night was full of dancing and singing.The daddy/daughter dance was AMAZING! Ashley and her daddy danced to a mash up of a variety of songs, and believe it or not, they owned their performance for sure! 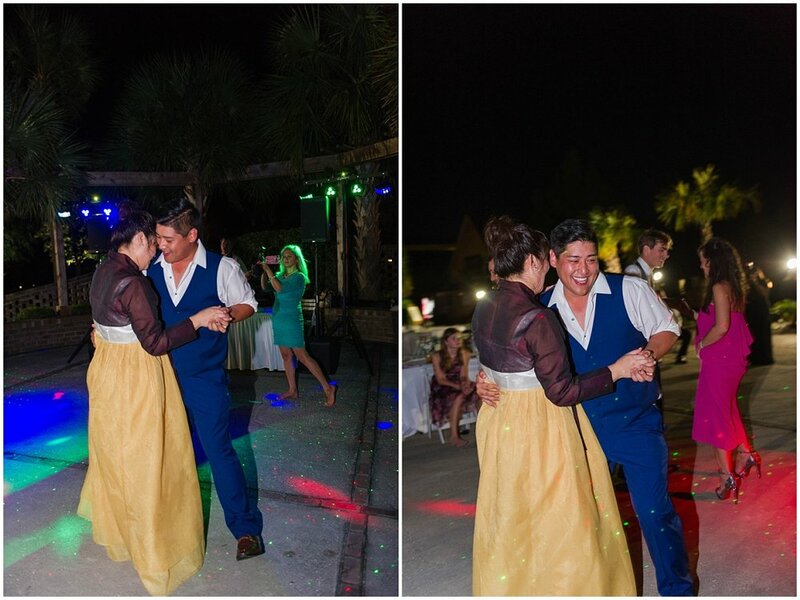 Matt and his beautiful mom also shared a sweet slow dance together, that was so touching and heartfelt. However, the most epic part of the night involving the dance floor, might have been when Journey’s “Don’t Stop Believing” began to play. I don’t think I have ever seen so many people start belting out the lyrics and strumming air guitars to a song like I did that evening (you’ll find those photos below!). The entire reception was unforgettable! Ashley and Matt truly have a huge support system, which makes all the difference in a marriage. The love was felt throughout the day and both families were equally beautiful and amazing to work with. I thoroughly enjoyed my time with everyone involved in making this day so special for both Ashley and Matt. They are truly blessed. 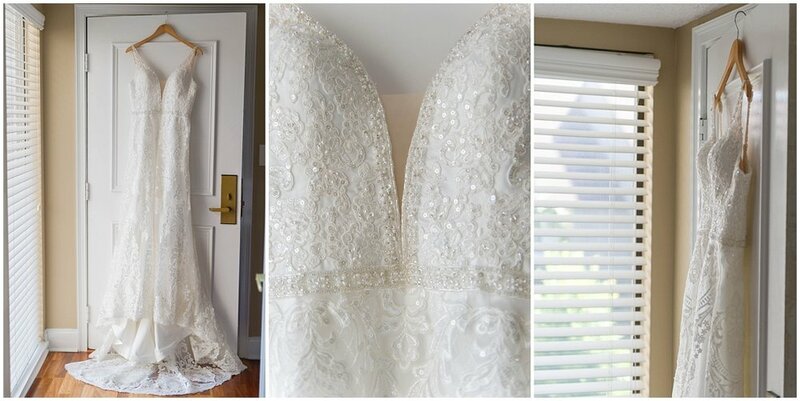 Take a look below at just a very small portion of the action taken throughout this amazing wedding day! And while you’re at it, leave this sweet couple some words of wisdom and love!